Bring more joy into your life! Ocean Jasper helps us to connect with the Ocean of Wisdom that resides in the collective unconscious of humanity, helping us to bridge & creatively communicate the timeless with the ephemeral. Ocean Jasper is a rare form of jasper found only at the ocean's edge in Madagascar, and collectible only at low tide. 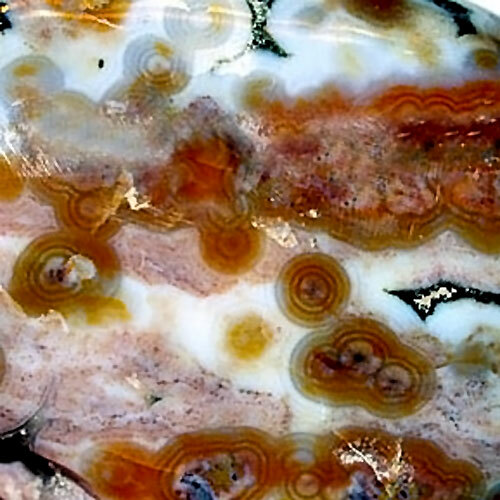 Ocean Jasper occurs in an amazing variety of colors and shapes, often displaying colorful patterns resembling biomorphic forms, with stripes, circles, and mandalas. Jasper has been used in Native American and other shamanic tradtions for millennia as a stone of protection and power. Read more about the varieties of Ocean Jasper in our Crystalpedia.